Provenance: Annely Juda Fine Art; Laurie Stewart. Best know as a printmaker, Stokoe produced three-dimensional works during a five-year period in the mid-1960s. ‘I was at the time emerging from a more gestural form of painting into experiments with the properties of pure colour, here exploiting gravity, height, perspective and balance’ (Letter to Paul Liss, 6 February 2007). 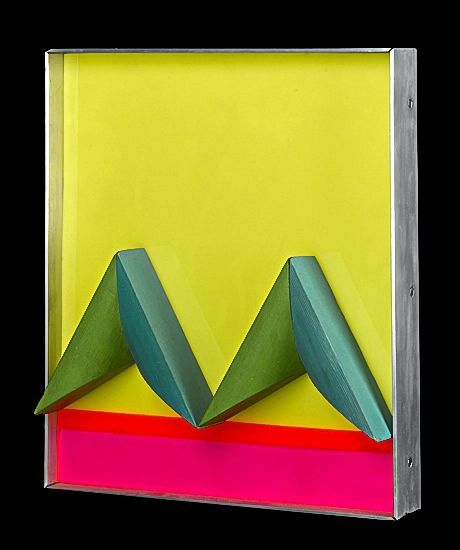 Like many artists of the period Stokoe was excited by the new possibilities of perspex as a material, and especially the wide range of exciting colours that could be sourced from Denny’s art suppliers in Hammersmith,West London. A fourth piece from this ‘quartet’ (as Stokoe refers to the ensemble) remains in the private collection of the artist.